The Zhuang have a rich literary tradition, both written and unwritten. Folk stories often take the form of songs and are passed down orally. They can be myths, legends, historical poems or even simply chants. The Zhuang have a written language known as Sawndip or Old Zhuang Script, which they use to transcribe their literature and other important documents such as contracts. Most of these folk tales are written in verse and some of them are over a thousand years old! One of these ancient legends has garnered much attention in recent years and is known as “Dahgyax Dahbengz” or “The Orphan Girl and the Rich Girl”. This is essentially an early version of the Cinderella story and has been found in old Zhuang opera scripts. Several written versions of the story date back to the 9th century, although it could be even older! Songs like these are often refined over a period of several years. For example, the “Song to Tell Others”, which is a philosophy on life, originated during the Sui Dynasty (581-618) but its final form wasn’t set until the late Ming Dynasty (1368-1644). Many of these songs have their roots in superstition, such as the “house raising” song which is sang after a new house is built. This song consists of two parts; the first describes the construction of a traditional stilt house; and the second is customarily believed to ward off evil spirits from the new home. Like many ethnic minorities, they are a deeply superstitious people and their customs reflect this. For example, in some Zhuang communities they love to eat dog meat, while in others there is a taboo on eating dog meat because, according to legend, the dog helped mankind in their time of need. The legend states that long ago there were no grains and the people were forced to eat wild plants. The only grain seeds were in Heaven but it was forbidden to bring them to earth. One day, a trusty dog decided he would go to heaven and procure the seeds for his beloved masters. Back in ancient times, dogs had nine tails so when the dog got to heaven he placed his tails on the ground and many of the seeds stuck in his fur. However, while he was collecting the seeds he was spotted by a guard. Before the dog could get away, the guard managed to chop off eight of his tails. He managed to get back to earth with one of his tails still intact and he gave the seeds to his human masters, allowing them to grow grain. In other versions of the legend, the dog is replaced by an ox and this may explain why some Zhuang communities happily eat dogs. These superstitions play a focal role in Zhuang funerals, as they believe that the souls of the deceased enter the netherworld but continue to assist the living. Ancestor worship is common and their burial rites are particularly unusual, as the dead are buried twice. The deceased is first wrapped in white cloth and, after three days, they are buried in a coffin along with a few of their favourite things. A Taoist priest or local shaman will preside over the funeral, depending on the family’s beliefs. Families will sometimes even arrange what is known as a “spirit marriage” to appease the souls of those who died unmarried! After three years, the deceased is disinterred and the bones are cleaned. They are then placed in a pottery urn and sprinkled with a red mineral called cinnabar. The urn is deposited in a cave or grotto until an appropriate burial site has been chosen in the clan cemetery. Once this has been done, the deceased is officially classed as an ancestor and can be worshipped at the ancestral shrine. However, the Zhuang believe that anyone who died a violent, untimely or accidental death could become an evil spirit if not buried properly. They must be cremated while a local necromancer or Taoist priest chants scripture. The remains are carried over a fire pit, which the necromancer or priest must jump over! It is believed that this process “changes” the ashes from those of an evil spirit into a benevolent ancestor spirit. Nowadays, most Mongols live in modern apartment blocks or fixed residences. 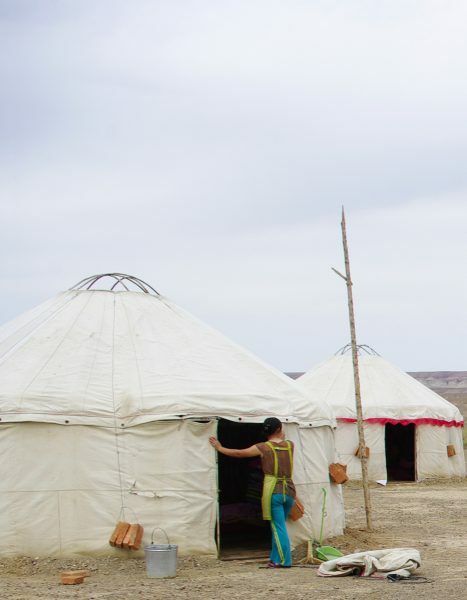 However, you’ll still find plenty of Mongol people maintaining their nomadic heritage and living on the grasslands in a type of portable domed tent known as a ger or yurt. Some people even alternate between the two; living in urban housing for part of the year and then shifting to a ger in order to tend to their livestock. The use of these unusual abodes dates back to the time of the mighty Genghis Khan, roughly around about the 12th century. With their bright white exteriors and perfectly rounded shape, these magnificent gers look like glittering pearls scattered across the jade-hued grasslands. They are made by first erecting a series of wooden lattice frames into a circular shape and then securing them with rope. This forms a self-supporting cylinder that is approximately head height. A door frame is then fitted at the front, while roof poles are used to give extra support. Finally, a canvas typically made from sheep’s wool is drawn across the wooden skeleton and the ger is complete. To give the ger additional stability during inclement weather, a heavy weight is suspended from the centre roof pole. The ger is ideal for both warm summers and harsh winters, since it is spacious, well-ventilated, but also well-insulated. Its conical roof is perfect for shedding rain, its white exterior is designed to reflect the sunlight during the peak of summer, and its ground-hugging base protects it against strong winds. Smaller gers are typically designed to accommodate up to 10 people, while larger ones can house over 20! Skilled Mongols can erect a ger within half an hour and dismantle it just as quickly, making it the ideal home for the wandering nomad. Once packed up on the back of a yak or camel, it can be easily transported to the next destination. In short, it’s the original mobile-home! According to tradition, the door to the ger should typically face south and the interior layout should be separated into approximately eight sections: the north, northwest, west, southwest, northeast, east, southeast, and centre. In the northern quarters, there is usually an eight-legged table that is used for keeping cosy quilts, exquisite rugs, and other clothing items. Men’s clothes must be placed above women’s clothes and it is considered taboo to put the neck of any piece of clothing facing the doorway, as this is a practice reserved for the deceased. The northwest is a holy area reserved solely for Buddha. It is resplendent with shrines and niches, all containing Buddhist statues that have been safely locked away. During religious festivals, the occupants of the ger will light candles and make offerings to these statues while praying for wealth, longevity, and good fortune. The wild western quarter is designated as the man’s private kingdom, full of guns, knives, saddles, and wrestling gear. The southwest is where yoghurt tanks and more saddles are kept, while the northeast houses cases of women’s clothes and jewellery. The eastern quarter acts as a sort of makeshift pantry, with meat, vegetables, fruits, and cooking utensils arranged into tiers on a special rack to keep them separate. The southeast is a much more flexible area, as it can be utilised in a number of ways depending on the season. In spring, it is filled with water buckets and dried cow’s dung, which is burned as fuel. During summer and autumn, a yoghurt tank and various clay utensils are added for the making of milk products. Under emergency circumstances, it is sometimes even used as a shelter for newly-born calves! Finally the centre, arguably the most significant section of the ger, is reserved for the fire stove. After a ger has been erected, the first thing that the occupants must do is decide on the position of the stove. Fire is the lifeblood of any Mongolian household, as it provides the means to boil water for tea, cook family meals, or simply keep the ger warm. For this reason, it is of paramount importance that the stove is positioned correctly within the ger. If you happen to be visiting a ger, there are a number of customs and taboos that you should be aware of. One must not approach a ger by automobile or on horseback within a certain radius. Touching the entryway or the centre roof poles of the ger is deemed impolite. Never step on or over a saddle, as the Mongols’ have a deep-rooted reverence for the horse and damaging or disregarding a saddle is considered highly disrespectful. Similarly, you shouldn’t sit in front of or near Buddhist shrines out of respect for the Buddha. Lastly, you should only take a seat after being invited to do so by your host, with male and female guests sitting separately. Remember, while the Mongols are renowned for their warm-hearted nature, these are the descendants of Genghis Khan, so the last thing you want to do is offend them! Different Miao communities celebrate different festivals and, in some cases, celebrate the same festival but at different times. However, the Miao New Year, the Sister’s Meal Festival and the Lusheng Festival are considered the most culturally significant and are celebrated by almost all Miao communities. 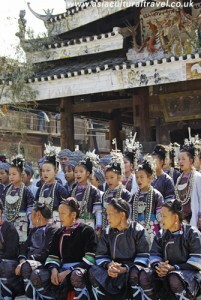 The Miao people celebrate a different New Year’s Day to that traditionally adhered to in China. It falls sometime during September to October according to the their lunar calendar. However, there is no exact date for the New Year’s Day each year and the official date is only announced two months prior to the festivities. In southeast Guizhou, the Miao community celebrate their New Year Festival on the “Rabbit Day” or the “Ox Day” of the lunar calendar according to ancient Miao tradition. 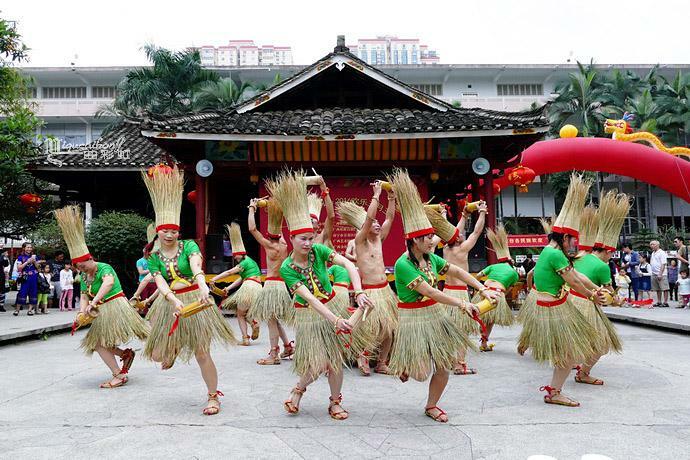 During the New Year festival, women will wear traditional clothes and there will be large parades. The locals will celebrate by beating drums, dancing to the music of the lusheng, horse racing and sometimes horse fighting or bull-fighting. The Sister’s Meal Festival is considered to be the oldest version of what we know as Valentine’s Day. 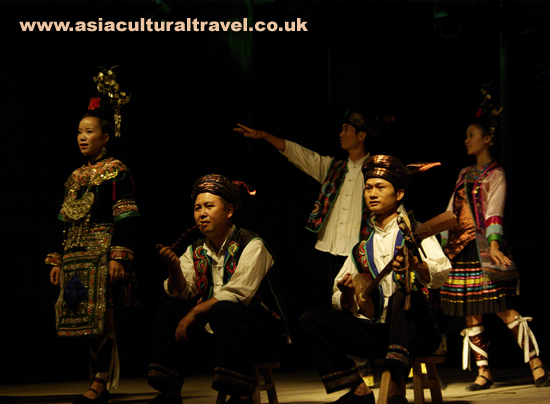 It is a favourite festival among the Miao communities in the Guizhou counties of Taijiang and Jianhe. It is celebrated from the 16th to the 18th of March according to the Chinese lunar calendar. Before the festival, Miao girls will go to the mountains to gather wild flowers and leaves, which are used to make coloured dye. This dye is used to make glutinous rice known as “sister’s rice”. 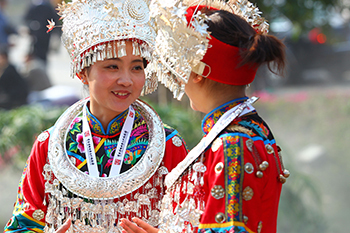 When the festival begins, the Miao girls will adorn themselves in their finest silver jewellery and meet by the banks of a river to make “sister’s rice”. They dye the rice blue, pink, yellow and white to represent spring, summer, autumn and winter respectively. Finally the men will arrive. They will each single out the woman they love and sing to them. The woman responds to these songs by giving the man a cup of rice wine and the sister’s rice, which is wrapped in a handkerchief covered in symbols. If the rice is offered with a pair of red chopsticks, it means the woman returns the man’s affection. If only one chopstick is offered, it is a polite refusal. If a piece of garlic or a red chilli is placed on the rice, this indicates a flat refusal. Pine needles scattered on the rice means the man should present silks and colourful cloths to the girl and she will wait for him to woo her. 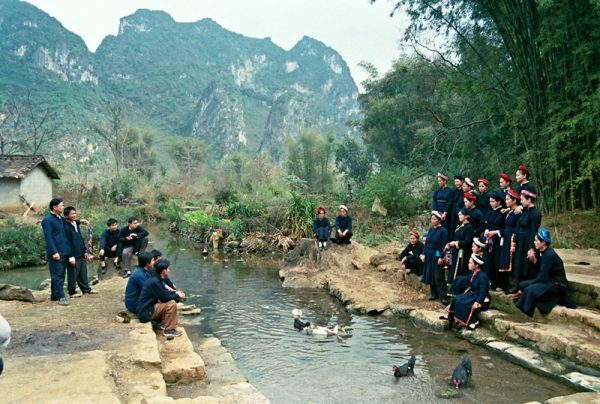 This festival is particularly important in terms of courtship, as it is one of the few occasions when men and women from other Miao villages are able to mingle freely. 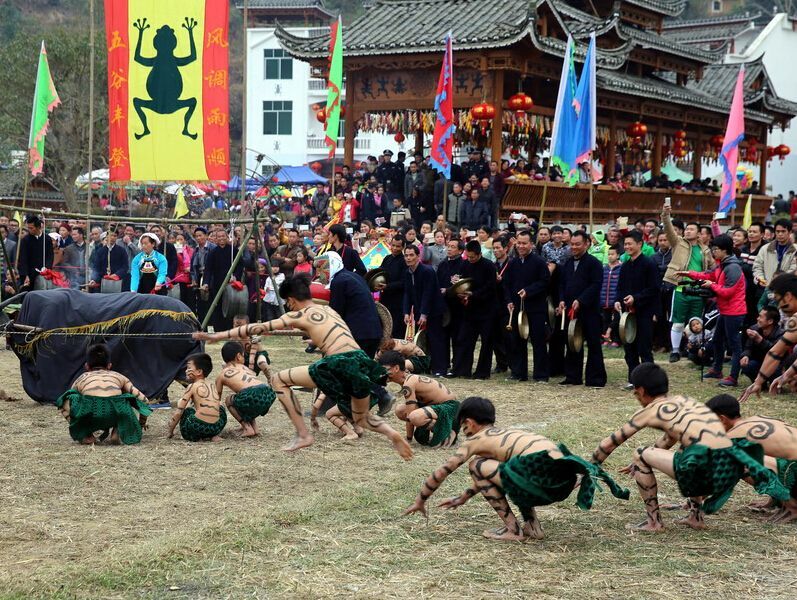 The Lusheng Festival is considered the most significant of all the Miao festivals and is celebrated widely throughout Guizhou, Yunnan and Sichuan. It is celebrated from the 16th to the 20th day of January according to the Chinese lunar calendar. During the Lusheng Festival, Miao people from surrounding villages will all come together in traditional dress and the men will all bring their lusheng. 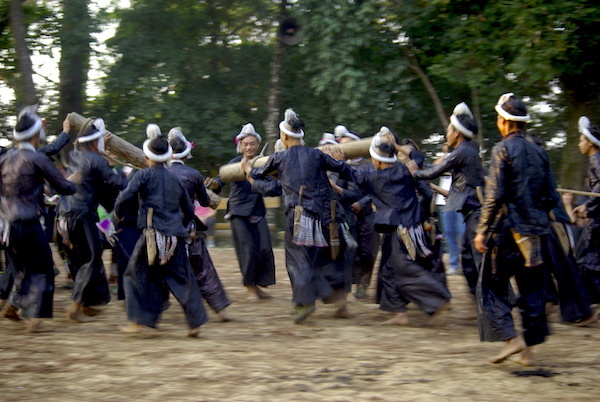 The men will play the lusheng whilst the women dance. They believe that this ceremony will bring a good harvest and good health to the people in the coming year. However, the festival is not simply about playing the lusheng and also features other activities typical of the Miao, such as singing, bullfighting, and horse racing. Although you can catch the Lusheng Festival in many Miao villages, the grandest one is considered to be the one held near Kaili in Guizhou. If you visit Guizhou in March, we recommend you visit Zhouxi Town, which is about 16 kilometres from Kaili city, where they hold a magnificent Lusheng Festival. If you miss it then there’s no need to worry! In Huangping County, about 75 kilometres outside of Kaili City, there’s another Lusheng Festival in November. In Yunnan, the Miao people also celebrate a festival called “Stepping over Flower Mountains”. Childless couples often repeat their vows to the fertility god at this time of year. As part of a religious gesture, they will offer wine to the young people in their village. The young people will then dance under a pine tree which has a bottle of wine hanging from it. It is said that many young men and women fall in love during the festivities and childless couples hope that this will help bring them children. Other commonly celebrated Miao festivals include the Dragon Boat Festival (national holiday), the Flower Mountain Festival (May 5th), the Tasting New Rice Festival (between June and July), the Pure Brightness Festival, and the Beginning of Autumn Festival. The customs and taboos of the Uyghur ethnic minority have been informed primarily by their rich history and their pious belief in Islam. When receiving guests, the host will typically offer them the best seats, treat them to some tea or milk, and then provide them with some small snacks, such as dried fruit or sweetmeats. If you are offered a drink, be sure to take the cup with both hands as this is a sign of courtesy. The same applies if you are being offered a gift. When dinner is ready to be served, the host will bring a kettle of water and invite the guests to wash their hands. This is because many Uyghur signature dishes, such as zhuafan or “hand rice”, are eaten with the hands or using a piece of naan bread rather than with cutlery. It is important to note that you should never place the naan bread upside down while eating it. According to their Islamic faith, Uyghurs are forbidden from eating pork and they also cannot eat any animal that has not been killed by a butcher in the traditional halal way. When it comes to dining etiquette, it is considered extremely rude for a guest to fiddle with the food in their dish, put back any food that they’ve taken, or leave some food in their bowl. If any food is dropped during the meal, the guest should quietly pick it up and wrap it in a tissue. Once the meal is finished, the elderly members of the household will lead the group in a profound act of worship known as a Dua. Guests should remain in their seats and try to stay as still as possible during the Dua. Dua: The term “dua” is an Arabic word that roughly translates to mean “supplication” or “invocation”. Within the Islamic faith, it is an act of worship whereby the worshipper calls out to Allah and expresses their devotedness to him. Deep within the aged pages of the Bardo Thödol or “Book of the Dead”, there lies a guide to traditional Tibetan funerary practices. When death occurs among the Tibetan people, what happens to your body largely depends on your religious status. The vast majority of Tibetans will receive a type of sky burial known as Jhator, which literally translates to “Feeding the Birds”. Be forewarned, this is not a metaphor! The body is taken up to the sky burial site in the mountains, where it is offered up to nature. While the process may seem deeply spiritual, this style of burial was born out of distinctly practical concerns. The rocky and often frozen ground in Tibet is much too tough for grave-digging, and firewood is a scare commodity that cannot be spared for cremation. 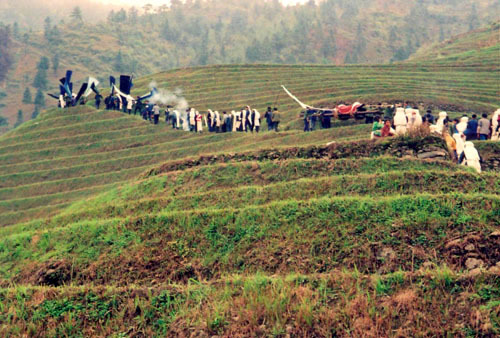 During the funeral ceremony, the body is covered with a white cloth and placed face down on the hillside. The family and friends of the deceased gather around as a monk or master of ceremonies, known in Tibetan as a tomden, removes the cloth and anchors the body to the ground while chanting sutras and waving incense. If the deceased was a monk, a symbol of religious significance will be carved into his back. Taking a saw-like knife, the tomden is then granted the unenviable task of removing the organs and cutting the body into small pieces. By this point, large vultures will have begun staring hungrily from hilltops near the sky burial site or hovering impatiently in circles above the body. Once the body has been prepared, the tomden steps back and allows the vultures to devour it. Crows and hawks wait on the outskirts, vying for their chance to pluck the leftover morsels from the bones. When the vultures have eaten their fill and the bones have been picked clean, the tomden smashes the bones with a mallet and mixes the crushed remains with barley flour, tea, sugar, and yak butter. This marrow-rich slurry is then cast onto the ground for the birds to feed on. If the corpse is entirely consumed by vultures, this is a sign that the person died without sin and their soul has safely gone to heaven. Should any parts of the corpse remain, they must be gathered and cremated while monks chant soul-redeeming sutras. Fascinating as this practice is, it is important to note that tourists must not watch the sky burial without an invitation from the deceased’s family and photographing or videoing the ceremony is strictly forbidden. When it comes to death, not everyone is subject to such fowl treatment! In the remote mountains of southern Tibet, there are simply not enough vultures to make sky burial a viable option, so the locals practice a traditional water burial as an alternative. The body is prepared in much the same way, but is cast into the water and fed to fish instead. As a mark of respect, people living in these regions will never eat any fish from the rivers or lakes used for water burial. In the heavily forested regions of southeastern Tibet, the abundance of trees means that locals have the luxury of cremation as the most popular funeral option. Throughout Tibet, eminent monks will also be honoured by being cremated, with their ashes either being stored in a stupa or buried in a coffin. Unlike in the Western world, where cremation takes place at special crematoriums, Tibetans simply pile firewood into a special crisscross pattern. The body is then “seated” within this wooden frame and, after wooden pieces have been placed over the head, oil or wine is poured onto the wood. The four corners of the wooden frame are set ablaze while monks face the deceased and chant sutras. As they chant, the monks will also extol the virtues of the deceased and express their wish that he will be accepted into heaven safely. Once the fire has burnt out, the ashes are collected and, after three days, they are stored. From that day onwards, monks are invited to chant every seven days in a further effort to redeem the soul of the deceased. This chanting lasts for forty-nine days, after which the funeral is officially complete. If you thought that was complex, it pales in comparison to the grand ceremony that is held when a tulku or “living Buddha”, such as the Dalai Lama or the Panchen Lama, passes away. After being embalmed with spices and antiseptics, the body is wrapped in a special cloth known as “Five-Coloured Silk”. Blue represents air, white symbolises water, yellow signifies earth, green denotes nature, and red is associated with fire. Together, these five colours form the cloth of the Buddha, which can only be used on occasions of exceptional significance. As monks chant sutras, the embalmed body is placed inside of a spirit stupa, which is then sealed. Day and night, monks will stand guard by the stupa and light butter lamps as a form of worship. There are different varieties of spirit stupa depending on the rank of the deceased, from gold and silver down to wood and mud. Only the Dalai Lama and the Panchen Lama are granted the honour of a golden spirit stupa after they die. After all, being transformed into a fixture for religious guidance seems like a fitting end for men who have devoted their life to their faith. Stupa: A hemispherical structure with a small interior designed for storing Buddhist relics and for private meditation. Tulku: A tulku is the re-incarnation of a deceased master of Tibetan Buddhism. Each time an old tulku dies, senior monks are charged with locating the young person who harbours their re-incarnated soul. The Dalai Lama is the most well-known example of a tulku. The Panchen Lama: The highest ranking lama after the Dalai Lama according to Tibetan Buddhism. Much like the environment in which they live, the customs of the Tibetan ethnic minority are marked by their elegance, solemnity, and deep spirituality. This is most often seen in the traditions surrounding a ceremonial white scarf, known as a hada. 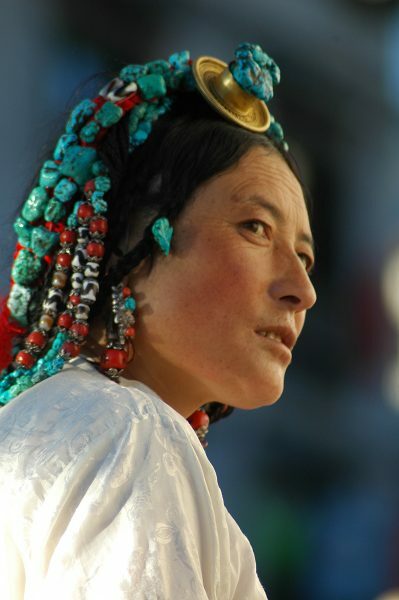 The hada features in both traditional Tibetan and Mongolian culture, but plays a vastly different role in each. 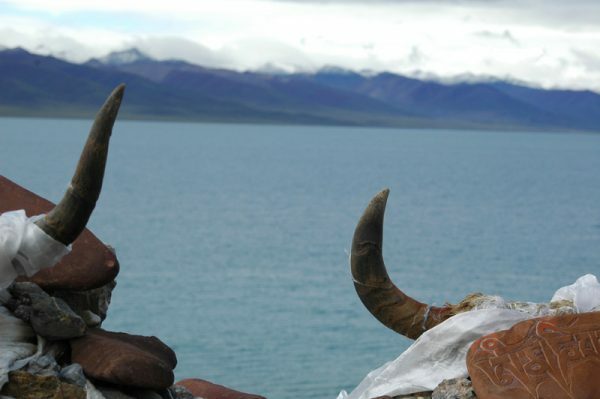 In Tibet, it evolved out of the ancient custom of adorning statues of deities with clothes. The white hada symbolises purity, faithfulness, and respect to the receiver. It is a common courtesy afforded to everyone, no matter their rank or background. The hada itself is made of loosely woven silk and features a range of patterns, which have auspicious or symbolic meanings. They can be as short as 50 centimetres (20 in) and as long as 4 metres (13 ft.). While most hada are white, there is a special version that is made up of five different colours: blue to represent the air; white to symbolise water; yellow to signify the earth; green to denote nature; and red to indicate fire. This five-coloured hada is considered to be the cloth of the Buddha and, as such, it must only be given on exceedingly important occasions. It is a highly valued gift that is exclusively offered to statues of the Buddha, eminent monks, or intimate relatives. The white hada is customarily offered during a variety of occasions, from regular greetings and temple visits to marriage ceremonies and funerals. In some cases, Tibetans will even leave behind a hada near their seat in a temple to signify that, although they have physically left, their heart remains. When presenting a hada, the giver typically takes the scarf in both hands, lifts it to the shoulder height of the recipient, extends their arms, bends over, and passes it to the recipient, taking care to ensure that their head is level with the hada. To show respect, the recipient should accept the hada with both hands. It is also considered acceptable to place the hada around someone’s neck if they are your social peers or juniors, but seniors or elders should have the hada placed in front of their seats or at their feet as a mark of deference. The practice of giving hada is so centric to Tibetan culture that, whenever a person leaves the house, they will carry several hada with them in case an opportunity arises where they might be expected to offer one. When writing letters, they will even enclose a miniature hada in the envelope! In most contexts, the hada is designed to extend good wishes and respect, but its significance may change slightly depending on the context. During festivals, a hada is exchanged to wish the recipient a happy holiday. At weddings, the bride and groom are presented with hada in the hopes that they will have everlasting harmony and a bright future together. At funerals, the family present hada to the guests so that the Buddha may bless them and the guests offer hada to the grieving relatives in order to express their condolences. Aside from the hada, there is a strict etiquette in Tibetan culture surrounding the act of greeting. When visiting relatives, it is customary for the visitor to carry a basket filled with gifts, a thermos flask of buttered tea, and a bucket full of chang. The basket should be covered with a cloth to ensure that no one can see inside. When the guest arrives, the host and hostess will welcome them warmly before enjoying a drink of the butter tea and the chang they have brought. After a long time spent chatting and catching up, the guest will finally present the host with their gift-basket. It is considered polite for the host to leave some of the gifts, such as food, within the basket for the guest to take back home, as this shows modesty and restraint. Not only that, but the host will be expected to add some inexpensive items to the basket, such as fresh vegetables, fresh fruit, or new clothes for the guest’s children. Most importantly of all, the host will take note of what the guest has brought so that, when they pay a visit, they can bring a gift-basket of similar value. Unlike most people, who give so that they can later receive, the Tibetans receive so that they can give! 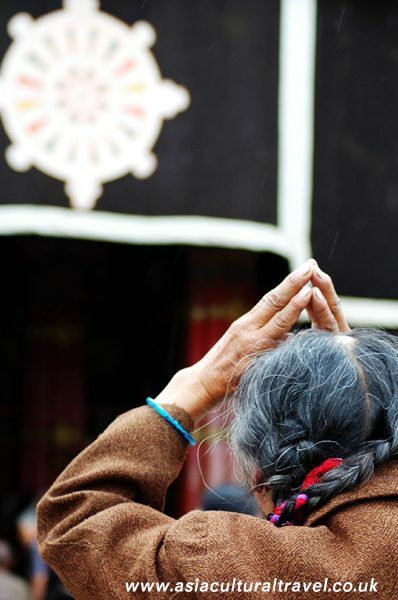 Superstition is also a prominent feature of Tibetan culture, with numerous taboos and omens being observed. A traveller who passes by a funeral procession, a source of running water, or a person carrying a pitcher of water is said to have good luck coming their way. A vulture or owl perched on a rooftop is a sign that death or misfortune will soon befall the inhabitants. Snowfall during a wedding is believed to be a sign that the newlyweds will face many difficulties in their marriage. By contrast, snowfall during a funeral means that the family will not suffer another death for a long time. In short, don’t dream of a white wedding, wish for a white funeral! Hada: A hada is a narrow strip of silk or cotton that is used by Mongolian and Tibetan people as a greeting gift. Although it has little monetary value, in a nomadic culture it carries deep symbolic value, as everything must be carried on one’s person and therefore must be deemed worthy to take up precious limited space. Chang: Chang is an alcoholic beverage brewed from highland barley, millet, or rice grains. It is popular among the Tibetan and Nepalese people. Although its alcohol content is low, it produces a warming sensation that is ideal in the frozen climes of Tibet and Nepal. Long ago, when the earth was in its infancy, there roamed a mythical monkey known as Pha Trelgen Changchup Sempa. Even his name was imbued with deep significance, with “pha” meaning “father”, “trelgen” meaning “old monkey”, “changchup” translating to “enlightenment”, and “sempa” meaning “intention”. He settled on Mount Gongori in Tibet, where he vowed to immerse himself in meditation and pursue a life of asceticism. One day, while he sat deep in thought, he was approached by a rock ogress named Ma Drag Sinmo. She begged the monkey to marry her and made every attempt to seduce him, but he refused, as his religious discipline meant he could not yield to temptation. In her desperation, the ogress then resorted to threats. She told the monkey that, if he would not marry her, then she would marry a demon and produce a multitude of smaller monsters, which would overrun the earth and destroy all other living creatures. Evidently she didn’t take rejection very well! The monkey despaired and, not knowing what to do, he consulted the bodhisattva Avalokiteśvara. Avalokiteśvara told the monkey that this was an auspicious sign and that he was destined to marry the ogress, so he gave the couple his blessing and the two were married. Within a few months, the ogress gave birth to six small monkeys and the elder monkey left his six children to grow up in the forest. After three years, he returned and, to his dismay, he found that they had multiplied to five hundred monkeys. The fruits of the forest were no longer enough to sustain them, and they beseeched their father to help them find food. At a loss once again, the elder monkey went back to Avalokiteśvara. The bodhisattva travelled to the sacred Mount Meru, but from here the story diverges. Some say he collected a handful of barley on the mountain, while others believe he plucked the five cereals from his own body and offered them to the elder monkey. Regardless of how it transpired, the elder monkey planted the cereals and, after a bumper harvest, he was able to feed all of his children. As they continued to engage in agriculture and move away from the forest, the monkeys gradually lost their tails and most of their hair. They began to use tools made from bone and stone, then wove their own clothes and built their own houses. Eventually they formed a venerable civilisation, from which the Tibetan people supposedly descended. So the next time you question your own family tree, imagine how strange it would be to have a monkey and an ogress as your ancestors! 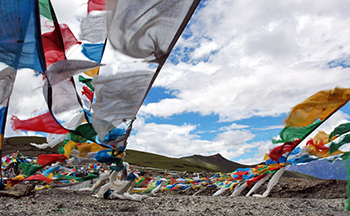 Living primarily in isolated locations throughout India, Nepal, Bhutan, and the Tibet Autonomous Region of China, the Tibetan people have maintained an air of mystery that has captured the curiosity of people throughout the world. They embody a culture defined by spirituality, communion with nature, and rigid discipline. Even their language is highly stylised, with honorific and ordinary versions for most words, which are used to address superiors or inferiors respectively. The indisputable importance that religion holds for Tibetans is reflected in this language, as there is a set of higher honorific terms that are only to be used when addressing the highest sect of Buddhist lamas. According to historical records, it is estimated that the ancestors of the Tibetan people began settling along the Yarlung Tsangpo River sometime before the Qin Dynasty (221-206 BC). The expansive grasslands and lush pastures allowed them to easily raise and support herds of sheep, goat, and yak, which became their primary source of income. However, the harsh climate meant they could only grow certain hardier varieties of grain, such as highland barley. Thus they evolved into an ethnic group primarily composed of farmers and pastoral nomads, with a clear distinction between peasantry and the elite landowning class. Their belief in and devotion to a higher power first manifested in the indigenous religion of Bön, which was gradually superseded by Buddhism during the 7th century. Eventually these two venerable faiths intermingled to form Tibetan Buddhism, the religion observed by the majority of Tibetans to this day. From the darkened corridors and elaborately decorated halls of the Potala Palace to the humble yurts on the craggy Tibetan Plateau, people from all walks of life carry prayer wheels, chant sutras, and prostrate themselves as a demonstration of their piety. This extreme devoutness has given birth to countless stunning works of art, including intricate thangka paintings, elegant statuary, and the semi-spiritual Epic of King Gesar, which is considered to be the longest hero epic in the world. While this level of piousness might lead you to think that the Tibetan people are solemn, that’s far from the truth! Religious festivals, such as the Losar Festival and the Shoton Festival, are celebrated with lively performances of Tibetan Opera, singing, dancing, and bountiful feasts. With such a rich and vibrant culture, it’s easy to see how the lifestyle of this enigmatic ethnic group has captured the imaginations of people from across the globe. Bodhisattva: The term literally means “one whose goal is awakening”. It refers to a person who seeks enlightenment and is thus on the path to becoming a Buddha. It can be applied to anyone, from a newly inducted Buddhist to a veteran or “celestial” bodhisattva who has achieved supernatural powers through their training. 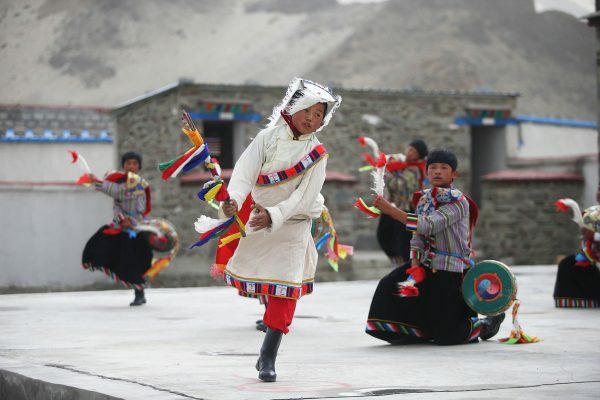 In spite of the hostile environment in which they live, the traditional garments of the Tibetan people are defined by their bright colours and elaborate ornamentation. Like precious stones and glimmering jewels, they stand out on the barren plains of the Tibetan plateau. Tibetans typically don long-sleeved jackets made of silk or cloth, covered by a loose robe tied at the right by a band. Nomadic herdsmen and women working in colder climates eschew the jacket in favour of sheepskin robes fringed with fur. While women tend to wear skirts with a multi-coloured apron over top and men wear trousers, they both opt for leather long-boots to combat the rocky terrain and felt or fur hats to keep themselves warm. For the sake of mobility, many Tibetans leave one or both shoulders uncovered and tie the sleeves around their waist when they are working. Both genders usually keep their hair long, with men coiling it into a single braid on the top of their head. Girls wear their hair in one braid until they turn seventeen, at which point they plait it into two braids or multiple smaller braids as part of a coming-of-age ceremony. Ornaments play an important role in Tibetan culture, so these braids will be dripping with finery. Historically and culturally speaking, jewellery was the tool used by Tibetans to distinguish the rich from the poor. Poorer nomads would only be able to afford simple jewellery, such as coral pieces, or none at all, while richer nomads would sport silver chains, gold teeth, and large coral earrings. In contrast to this lavish decoration, the clothes of the Tibetan monks are modest and solemn in nature. They traditionally wear a sleeveless garment known as a kasaya, which translates to mean “colour that is not pure” in Sanskrit. This is thought to derive from the fact that the kasaya is purplish red in colour, rather than being a pure primary colour. It is approximately 2.5 times the length of the human body and is wrapped around the upper body with the right shoulder exposed. The quality and colour of the cloth used to make the kasaya varies depending on the rank and importance of the wearer. The most eminent monks will have their garments fringed with yellow silk brocade or will wear clothes made from the finest yellow silks and satins. While the style of the kasaya worn by different Tibetan Buddhist sects rarely varies, they each wear different types of hats to distinguish themselves. In short, you should be able to tell them apart at the drop of a hat! 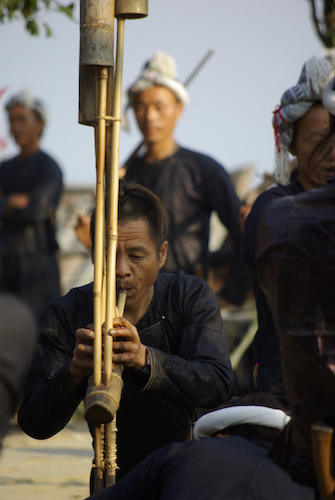 From dusk till dawn, the villages of the Dong people are saturated with the harmonious sound of singing. 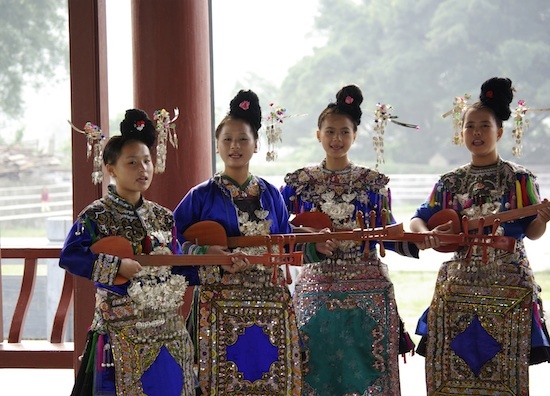 This ethnic group has become famous throughout China for polyphonic folk songs known as “Dage” or Grand Songs. While some of these folk songs are accompanied by the pipa, most are sung without any musical accompaniment. The Dong ethnic minority have no written language, so they use folk songs to narrate their daily life, express their feelings, and keep a record of their history. All of Dong culture is preserved in these magnificent folk songs. The more songs a Dong person knows, the better educated they are considered to be. Singing is so important to the Dong people that supposedly, in the past, if a man couldn’t sing then he would struggle to find a wife! From the age of five, children in the village will be trained by one of the accomplished local singers free of charge. These singing teachers enjoy a special status as highly revered members of the community. In short, people are always singing their praises! 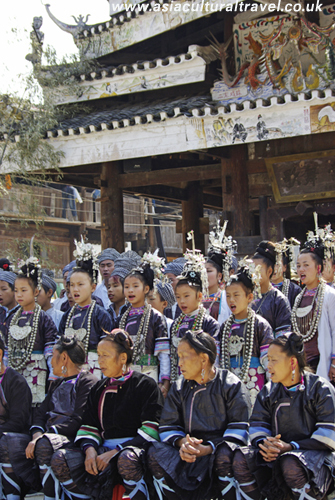 Depending on age and gender, villagers are separated into different choirs, and each choir is distinguished by their particular style of singing and the topics of their songs. For example, choirs of young children will sound sweet and lively, while choirs of young girls sound innocent and full of passion, and choirs of men have a depth to their voices that sounds haunting and powerful. Female choirs incorporate sopranos, mezzo-sopranos, and contraltos, and male choirs are comprised of countertenors, tenors, baritones, and basses. The most talented singers in any Dong village make up what are called Kam Grand Choirs or Kgal Laox in the native Dong language. The Kam Grand Choir tradition is thought to have originated sometime during the Warring States Period (475BC-221 BC), making it over 2,500 years old! In 2009, it was made a World Class Intangible Cultural Heritage by UNESCO. A Kam Grand Choir is a polyphonic choir that sings without the help of a conductor or any accompanying orchestra. Most songs performed by these choirs consist of a prelude, a main body made up of several sections, and an ending. These songs are designed to imitate the natural world, such as the chirping of insects, the gurgling of streams, the whistling of the wind, and other soothing natural sounds. The singing is meant to spur the soul and originate from the heart, while simultaneously promoting harmony between mankind and nature. The solo singing will be done by the sopranos and the bass section is sung by the rest of the choir. Depending on the style of song, the soprano section will be performed by between one and three individuals. There are Male Choirs, Female Choirs, and Child Choirs, and each of these is further separated into four main categories based on their styles, melodies, and the content of their songs. In the Dong dialect, these four categories are called Gating, Gama, Gaxiang, and Gaji. Gating or “Choirs of Sound” perform songs that are characterised by an undulating melody and short lyrics, employing the use of several sopranos. This style of song is dedicated almost entirely to imitating the sounds of the natural world, with the famed “Cicada Song” being the finest example. Gama or “Romance Choirs” perform songs revolving around the theme of love and employ slow rhythms and soft voices to heighten their effect. Gaxiang or “Morality Choirs” perform songs that are designed to educate, advise, or console the audience by praising virtues and condemning inappropriate behaviour. These songs have an even tune in order to draw focus to their lyrics. Finally, Gaji or “Narrative Choirs” perform songs that focus on dialogue and plot, and are characterised by slow, melancholy, or soothing tunes. The Gaji songs are some of the hardest to perform, as they require the performers to remember lengthy lyrics, complicated plots, and various key facial expressions. Usually these songs will be led by only one soprano. Many folktales are preserved in Dong oral literature, usually in the form of songs. The focus of many popular tales re-count the leaders of past uprisings, such as Wu Mian, who led the 1378 rebellion against the Ming Dynasty during drought and famine, and Wu Jinyin, who revolted in 1740 because of a rise in grain taxes. Non-historical folktales include the two orphan brothers, Ding Lang and the dragon princess, the frog and the swallow, the dog, and the singing tree. The best time to enjoy the singing of the Dong people is during their New Year festival, which is normally sometime between late October and early November every year according to the Chinese lunar calendar. The New Year celebrations are resplendent with lively singing competitions, joyous folk dances, and vibrant performances that are truly magnificent to behold. Pipa: A four-stringed plucking instrument that has a pear-shaped wooden body and anywhere from 12 to 26 frets. It is sometimes referred to as the Chinese lute.